St. Petersburg Conservatory of Music, an accomplished violist, and an inspirational teacher. 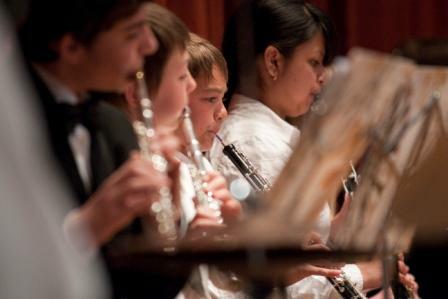 Our mission is to enrich children's lives through the wonderful world of music. With the customized arrangements of music pieces, we give our musicians at various skill levels an opportunity to play together in a supportive and fun environment. 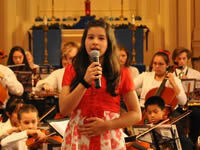 Our musicians are encouraged to their highest potential in music they love. We play a variety of pieces throughout the school year, and each musician is given an opportunity to perform solo pieces of his/her choice in recitals. of Music, and other prestigious institutions. 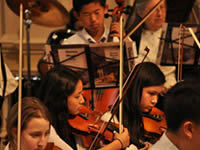 Our repertoire includes classical music, popular music, and jazz. "Once again, yesterday's performance was beautiful. I closed my eyes to just listen and forgot it was children playing. " "We will never forget Carnegie and are grateful that Zoe is a part of this talented group of musicians. How many kids can say they played Carnegie? At age 12? We appreciate all the hard work you both do and look forward to 2017, trumpets and all." "Thank you for the brilliant work on the performance. Everyone shone. It was truly magical." 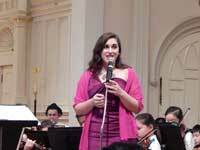 "Thank you, Sunset Youth Orchestra! Thank you Tatiana! That was a great performance today!" "Tatiana, Saturday's performance was the best performance to date. Not just hat it was superb! Please extend my congratulations to all the other teachers as well." "We want to thank you very much for helping Roman with his solo practice. We were moved by his performance in the concert. All the musicians played so beautifully throughout the whole concert. We were mesmerized!" "We enjoyed our first year with SYO very much and look forward to being a part of your great orchestra group again in the next season. Bryan and I are proud of Austin and Andrew for their participation. Thank you for accepting us."